PRESIDENT MICHAEL D Higgins and his wife Sabina will host Prince Charles and the Duchess of Cornwall Camilla at a private dinner tonight. The dinner comes as the Prince of Wales kicks off a three-day visit to Ireland. It will be his third visit to Áras an Uachtaráin. He previously visited in 1995 and 2002, making this the third Irish President to have hosted him. Following their arrival this afternoon, the Prince and Duchess will be invited to sign the visitors’ book, followed by a meeting between the President and Prince Charles. The President and Sabina will then accompany their guests to the Peace Bell, a monument designed to mark the ten-year anniversary of the Belfast Agreement, in the grounds of Áras an Uachtaráin, before going on to meet with a small group of young people who have excelled in the fields of sport, art, music, science, agriculture and advocacy. The President and the Prince have met on a number of occasions, including during the President’s State Visit to the UK in April 2014. More recently, the President and the Prince met in Turkey in April 2015, at the centenary commemorations of the Battle of Gallipoli, and later that year at Lough Cutra in Co. Galway. 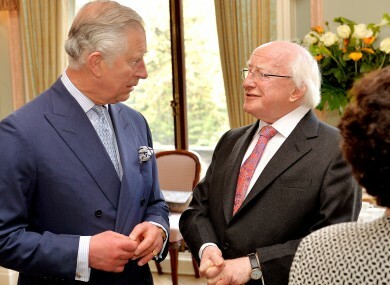 Email “Michael D Higgins will have a private dinner with Prince Charles tonight”. Feedback on “Michael D Higgins will have a private dinner with Prince Charles tonight”.